Cardiomyopathy literally means heart muscle disease and is a term that refers to any condition where heart muscle function is abnormal. While some people can have a subclinical cardiomyopathy without any obvious symptoms, usually they ultimately end up with heart failure, especially if left untreated. The most common symptoms from heart failure are shortness of breath (dyspnea) and peripheral edema (swelling of the legs) and fatigue. People with cardiomyopathy could be at risk of arrhythmias including atrial fibrillation and more dangerous forms or irregular heartbeats such as ventricular tachycardia. Most cardiomyopathies are caused by other conditions that damage of the myocardium, although some cardiomyopathies can be genetic. The most common form of cardiomyopathy is dilated cardiomyopathy where the heart becomes enlarged. It is most commonly caused by prior heart attacks due to coronary artery disease (ischemic cardiomyopathy) or long-standing/ uncontrolled hypertension (hypertensive cardiomyopathy). Many other factors can contribute to a cardiomyopathy including some drugs or alcohol. Diabetes can also cause diabetic cardiomyopathy. Often significant cardiac valve dysfunction is due to the heart enlarging, such as mitral regurgitation although aortic or mitral regurgitation can lead to dysfunction of the heart muscle and heart failure. In particular, when a patient presents with significant heart failure with severe dysfunction of their heart muscle and significant mitral regurgitation, it can be difficult to know which came first and whether an intrinsic cardiomyopathy is present. 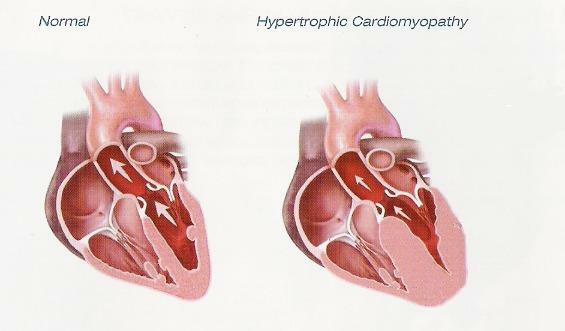 Hypertrophic cardiomyopathy refers to abnormally thickened heart muscle. While a patient with long-standing untreated hypertension could develop significant hypertrophy, hypertrophic cardiomyopathy usually refers to a genetically acquired type of cardiomyopathy. It can effect relatively young people who can be at risk of sudden cardiac death and sometimes can go on to develop heart failure. There are delayed-onset forms of hypertrophic cardiomyopathy that can be seen in the elderly as well. Cardiomyopathies can be caused by infiltration of the heart muscle from metabolic or storage diseases such amyloidosis or hemochromatosis. Some of these cardiomyopathies can impair the ability of the heart to adequately relax in between each beat leading to heart failure and are classified as a restrictive cardiomyopathy. 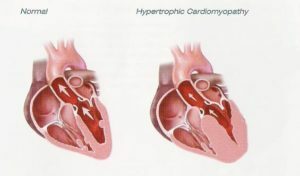 There are several other rarer forms of cardiomyopathies including ventricular non-compaction; arrhythmogenic right ventricular dysplasia; mitochondrial myopathy or cardiomyopathy associated with muscular dystrophy; Takotsubo cardiomyopathy (or “broken-heart syndrome”); and obesity-associated cardiomyopathy. Overactive thyroid disease (hyperthyroidism) can lead to a cardiomyopathy as well as other hormonal imbalances such as acromegaly. Certain vitamin deficiencies and certain infections including HIV and Chagas Disease can lead to cardiomyopathy. Peri-partum cardiomyopathy can occur in the third trimester of pregnancy, around the time of delivery or soon after and can lead to severe heart failure. Cardiomyopathy can occur after a viral infection leading to acute inflammation of the myocardium known as myocarditis. Cardiomyopathies of unknown etiology are known as idiopathic cardiomyopathy. Treatment of cardiomyopathy would involve treating underlying causes, but is usually a matter of routine congestive heart failure treatment with medications. When diagnosed early enough and medical management is given with frequent follow-up, many patients can improve and stabilize. When patients do not adequately respond and continue having significant dysfunction and heart failure, an automated implantable cardiac defibrillator might need to be implanted to reduce the risk of sudden cardiac death. Some patients respond to a special type of pacemaker that “resynchronizes” the electrical system of each heart beat to improve cardiac function. In patients whom continue to have disabling heart failure and do not adequately respond to the above treatments, a left-ventricular assist device (LVAD) might be needed to support their cardiac function and they might be listed for a heart transplant if they are an acceptable candidate. Researchers are working on stem-cell therapy to help improve cardiac function, but this is considered experimental.